Mitchell Gallery Exhibition Schedule 2000-2001. Exhibitions include: Ship to Shore: Marine Paintings from the Butler Institute of American Art; Works by Warhol from the Cochran Collection; American Landscape from the Paine Art Center and Gardens; Worldviews: Maya Ceramics from the Palmer Collection; St. John's College Community Art Exhibition; and It all Began Here in Annapolis: An Exhibit on Thoroughbred Racing in Colonial Maryland. 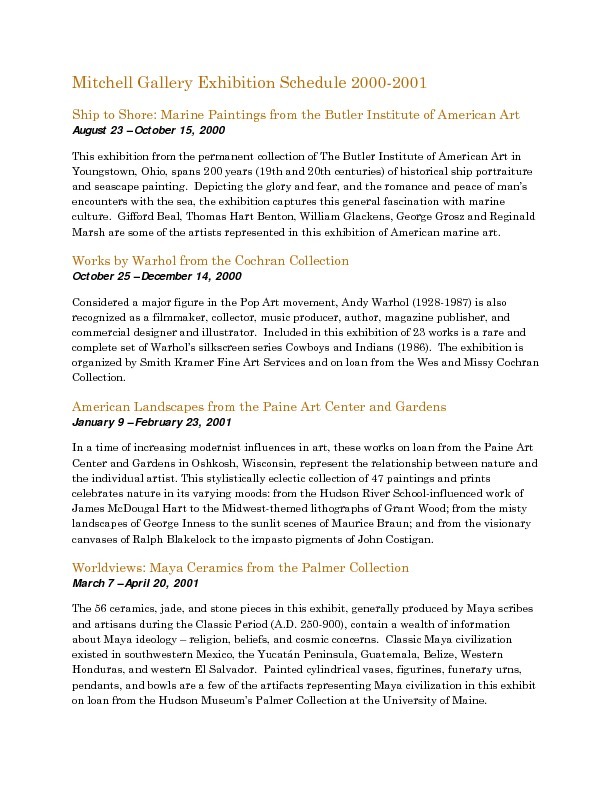 Mitchell Art Gallery, “Mitchell Gallery Exhibition Schedule 2000-2001,” St. John's College Digital Archives, accessed April 24, 2019, http://digitalarchives.sjc.edu/items/show/2698.